Chad le Clos was ready to ‘take it on the chin’, as he put it, as he spoke to the media for the first time since finishing fourth in the Olympic 200m butterfly final in Rio. ‘I’ll take it on the chin, I’ll assess it and I’ll move on. I’ve moved on already. I let a lot of people down, I let my country down. I should have definitely won that race,’ he said of the fourth place finish in the much-hyped rematch with Michael Phelps. 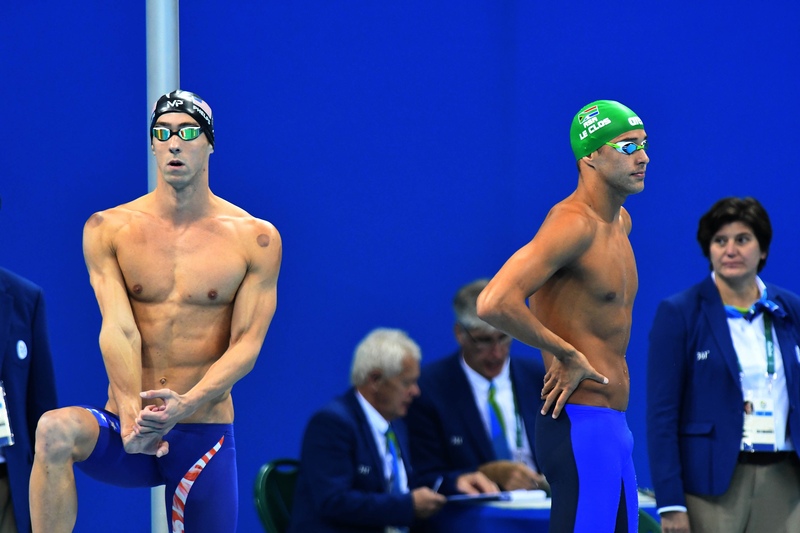 The expectation before Tuesday’s 200m final was amplified by a video that went viral of Le Clos taunting Phelps in the ready room before their semi-final, with the American legend scowling into the empty space ahead of him as a smiling Le Clos shadow boxed in front of him. When asked how the atmosphere was before the final, in the wake of the video being circulated around the globe, Le Clos said that he hadn’t seen it. ‘The atmosphere was normal, I haven’t watched it … I haven’t been on social media for a long time, I haven’t been on my phone. ‘Congratulations to Michael, he’s a phenomenal champion. I’m in good shape, the best shape of my life and there was no reason to swim that slow. We will assess it and not make any excuses. There may have been reasons for the defeat but I’ll never say that. Immediately after that final, Le Clos cut a distraught figure as he buried his head in a towel and bypassed the media in the mixed zone, an area where athletes are obliged to give interviews, no matter how uncomfortable the situation. The reality is that it can be a quick couple of soundbites and then move on. However, he is not the only South African swimmer to have walked straight on by during these Games. ‘I’m sorry about the other night, I don’t know what to say.’ It takes a man to admit he made a mistake and Le Clos will have grown six feet taller in many people’s eyes for ‘apologising’. There has been mixed feedback around the social media forums relating to Le Clos’ post-race ‘behaviour’, but now it’s time to move on and look ahead. He is a champion swimmer and a proud South African ambassador. Perhaps he and Phelps need to go into a locked room together, alone, and sort things out because too much smack-talk and cheap tricks have spoiled what should be a fantastic swimming rivalry. And, importantly, a friendship between a legend and a brilliant young star. ‘The kid’s got talent,’ Phelps said of Le Clos after winning the 20th gold of his career. Maybe he was being derogatory, maybe he meant it as a true compliment. We’ll have to ask him that later. Now’s the time to look forward and Le Clos was happy to be back doing what he does best, swimming – and swimming fast. ‘It feels great to be back in the water. The last few hours have been difficult to say the least. I don’t know what to say. I needed to get that one [100m butterfly heat] out the way, I was a bit rusty. ‘Going into the 100m I’ve got nothing to lose. He [Phelps] is the defending champion and I have the support of everyone. I’m very hungry for the 100m, hungrier than I’ve ever been, very happy, excited. He tried his best, he was under pressure and he chocked (it happens). Its okay Chad, we love you. That should be motivation not distraction. Phelps ‘let the swimming do the talking’ while others were busy talking Phelps was preparing himself. Are you going to tell us how the SA football team also let us down at the Olympics. I’m sorry, but when did you get your medal? Chad, your swimming is an absolute treat to watch. You make our beautiful country very proud. Chad is a hero for just making it to the Olympics. It is astounding the resources American athletes have at their disposal. Every American should be an Olympian but many choose to work at Walmart or just be mediocre. Chad gave his best, that’s an awesome achievement for him and testament that South Africa is a great place that produces great leaders and true heroes. Just go on Twitter and read the vicious comments written about Chad. That’s how they are, I live and work in the US and have experienced their mediocrity and meanness. We are better than that and Chad is the real winner for representing a great nation. So how many gold medals, or ANY, do you have? How dare you judge someone who is going through the toughest time in his life? Okay Sally Giles he did not choke. Ralph … you put urself in his shoes. When my mum was having treatment, it was the worst time in our lives. Chad has BOTH parents fighting … double the trauma of watching but being unable to help add to that, the Olympics snd knowing there are people like you out there who put added pressure on his shoulders. Show some empathy. First round exit for both teams as expected. Le Clos is still a Champ and for the mere fact that he still went to the Olympics after foundibg out that both his parents diagnosed with cancer just shows the character he has. No way did you let us down … you went over there despite the really difficult time your family are going through, and you SWAM! YOU TRIED AND GAVE THE BEST YOU COULD GIVE. You’re not a ‘let down’ Chad, on the contrary, you’re a true hero. TRUE hero indeed. Proud of u Chad. Tlaishego Victor Mohlala….medal for? Being a supporter doesnt mean that you only support someone during the good times. You are a true supporter when you can support someone through difficult times aswell. No matter what. No one minds if you give your best and don’t win. Tough competition. Some people do care if you act like a doos before you get in the water though. Chad is a hero. Period. In our eyes and in our hearts, you will always be a champion. It is okay Chad, you are still a champ. We support you no matter what. Keep your head up and do the best you can. Chad let no one down. He swam a fantastic race. Well done Chad! He is still my hero! Every single athlete that gets selected to participate is a hero! No matter what you do on the day – medal or not, you are an Olympian! Super proud of you still a champion. No you didnt!!! You will always be OUR hero!!!!! Nee jy het nie. Jy is net ‘n mens. Next time Chad. It is possible. Why was he looking where everyone else is in his race? That’s dirty swimmer habits! Unnecessary energy!!! You will forever be our hero! You can never let us down, Chad. You’re our hero, just keep your head up and focus on your next race. I just want to say that Federer used to cry when he lost. He was that disappointed in himself. Federer is now the greatest player in tennis history. He is the greatest there ever was and will be. You had a bad year!! No worries you still have 1 left!!! Lets do this!!! And remember we learn from our mistakes! Chin-up Chad!!! One disappointing swim does not define you. We are proud of you for who you are and what joy you brought us already. Now the pressure is off. Go and give your all – you are still our best. Manning up to your disappointment is leadership and character. Go ! .. get them. AND.. Michael Phelps is the greatest swimmer anyway – if you beat him or not and you are our Best if you best him or not. Go and be your best.!! You made us proud Chad. You got the silver for us. Now its time to regroup. Yeah, that really cost him the race. Rule #1 of a race= Don’t look where your opponents are until you finish. Dit is nie hoe jy val nie! Wys hulle hoe jy gaan opstaan! Jy is almal se hero! You didn’t let anyone down. You did your best. We love and respect you. Always be proud of you Chad.